Attention service providers! Community health workers! Educators! Medical professionals! Youth! 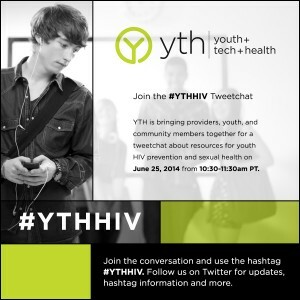 You are all invited to participate in #YTHHIV, a live tweetchat hosted by YTH (@YTHorg) on Wednesday, June 25 from 10:30 – 11:30am, to discuss the many questions surrounding youth HIV prevention and sexual health. According to the Centers for Disease Control and Prevention, 1 in 4 new HIV infections occur among young people ages 13-24. 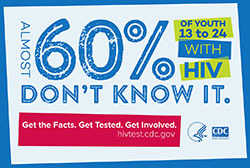 Yet 60% of young people with HIV don’t even know that they are infected. HIV prevention efforts have made a great impact on HIV/AIDS throughout the United States, but a great amount of work still remains to be done. Panelists and participants will discuss a broad range of topics ranging from doctor-patient confidentiality to how much access the Affordable Care Act’s provides to HIV testing and treatment. Other topics of conversation will include diversity and inclusion in pro-health movements and youth-specific HIV services. The chat will focus on broad themes of prevention and education, with sub-topics such as testing, prevention, healthy living with HIV, and messaging in youth-geared initiatives. Interested in participating? Mark your calendars for Wednesday, June 25th from 10:30am-11:30am PT and follow @YTHorg on Twitter. Join us at #YTHHIV with your questions and resources. Tweet you there! Infographic from the Centers for Disease Control and Prevention. tags: diverse, education, HIV, HIV/AIDS, inclusive, prevention, youth health, youth-friendly services.